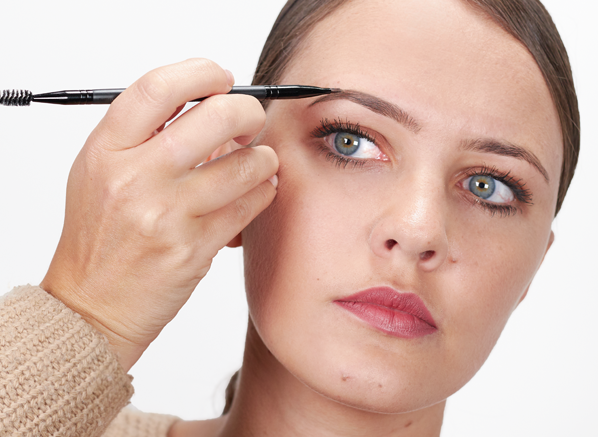 Shaping your eyebrows isn’t as easy as it should be. Whether or not you have a lot of hair to work with, finding the right texture and tone can be hard work – but we’re here to change that. When I was younger I plucked and waxed my eyebrows quite a lot. Now years later, I find I’m left with random patches that haven’t grown back and the Brow Master Duo is my perfect tool for filling in all of the gaps. I find powder really hard to use because it’s hard to blend in and fill in spaces. I’m all about creating an arch and adding length, and this brow cream adds body effortlessly without looking fake. Another reason to love this product is the fact that it comes with a brush! 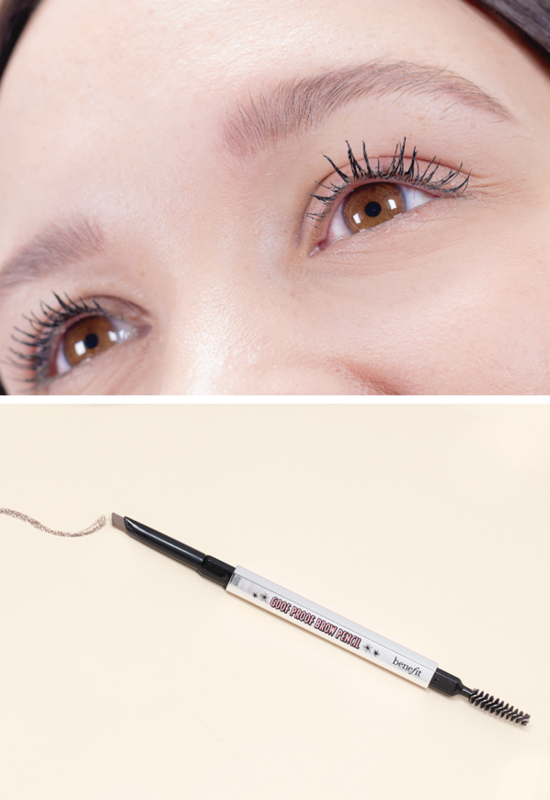 My brow hairs are so long and the spoolie works brilliantly at taming and keeping them in place, whereas the angled end is short but dense enough to create brow-like hairs without too much effort. I’ve never had a great relationship with my brows. Because they’re so sparse and the hairs are quite short and fine I’m too afraid to pluck or wax for fear of not having much left to work with – and so they’ve become pretty, well… shapeless. Add to that their lopsidedness, and you’ve got a recipe for lacklustre brows. 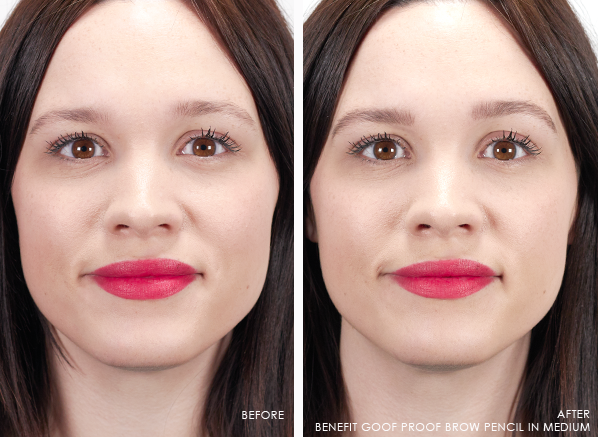 The product I reach for to give me shape, definition and colour is the Benefit Goof Proof Brow Pencil, which is a truly foolproof way to fake some killer arches thanks to its precise, angled tip. 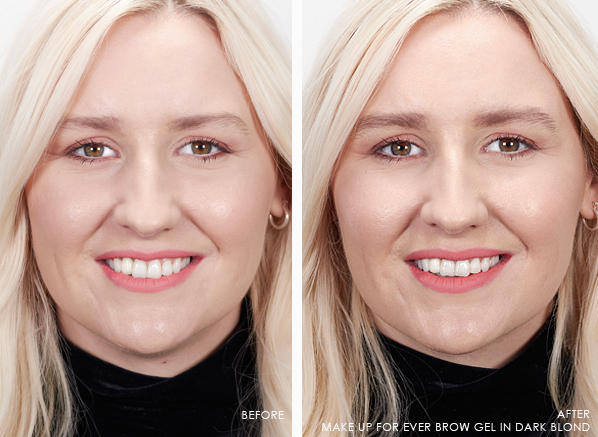 I use it with a light hand to create more of a natural look (if I go too heavy with my brows, I can look a bit angry), adding little hair-like strokes in the sparse patches and I instantly look more groomed. I then tidy them up a bit with the spoolie end, and I’m good to go! There’s nothing I love more than a pair of groomed, bushy eyebrows! After spending the whole of last year growing my brows out, I find that in between salon visits the hairs tend to get slightly unruly and need to be put back into their place, pronto. Since transitioning to brow gel, I haven’t looked back. In one coat I can create a natural, inoffensive finish that looks subtle but still defined. 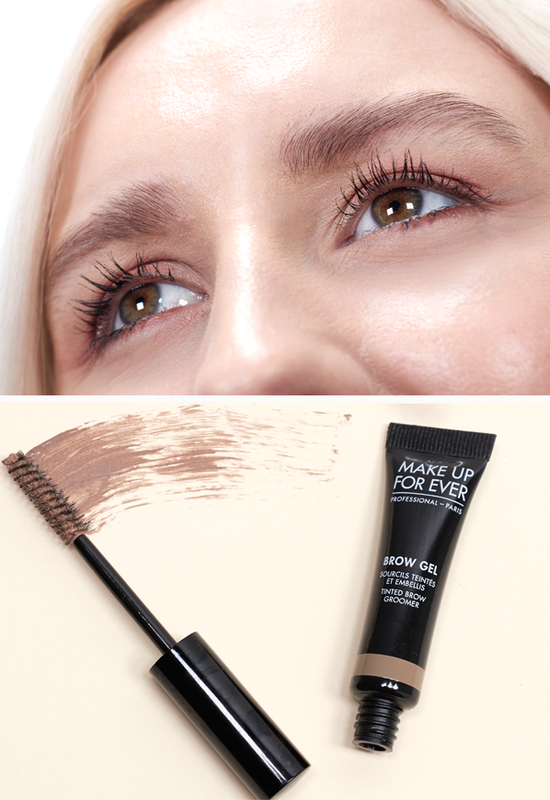 Although my original brow style is quite straight and undone, MAKE UP FOR EVER’s Brow Gel is what has transformed my makeup routine. Its innovative brush picks up each hair, placing it neatly into place without a sticky or crunchy finish, even allowing me to create arches! I highly recommend it to those who want fuss-free brows that can be created in seconds. 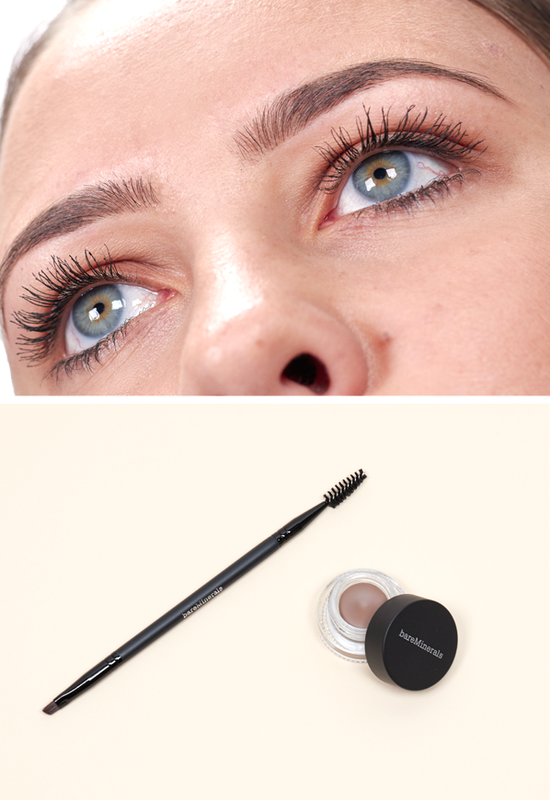 It’s impossible to get your brows wrong with Brow Zings; its waxy formula is so easy and quick to use, you don’t need to be a makeup artist to use it – I’d never, ever be without it! 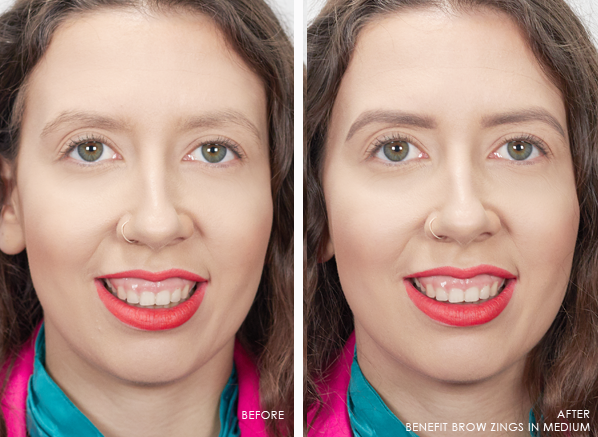 If, like me, you hate having to touch up your makeup, Brow Zings doesn’t budge. I’ve worn this in hot countries and it’s completely sweat-proof! As my brows are quite fair, I prefer my brows to look natural. 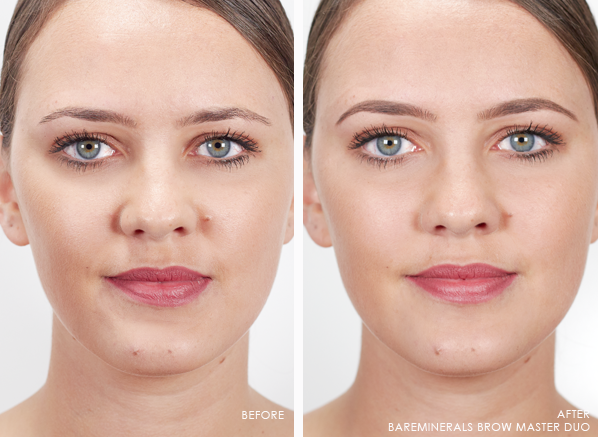 The soft, buildable texture of Brow Zings does this so well. I love that you’re able to blend the two colours to create a custom built shade, and what’s even more amazing is the number of tools that come with the kit. You even get a pair of tweezers for any stray hairs that need to be plucked away! To celebrate National Brow Day on October 2nd. 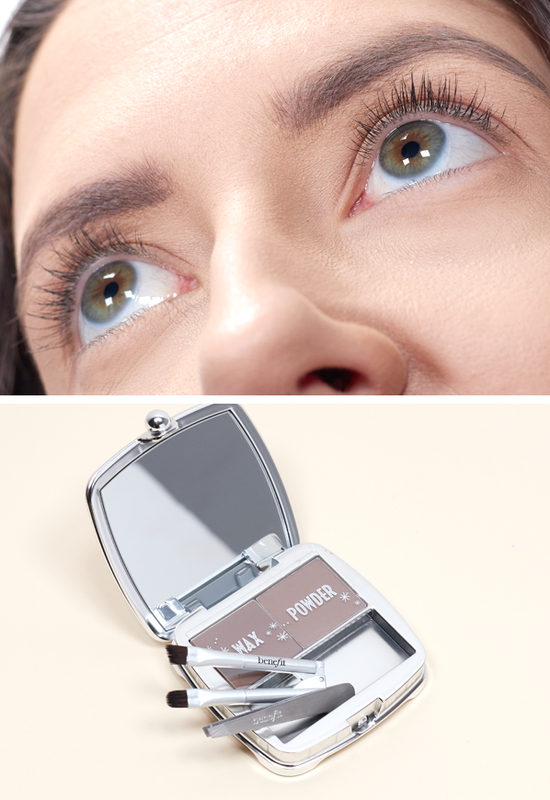 We’ve got 2x Benefit Magical Brow Stars Gift Set to giveaway over on Facebook! Head to this post to win you and a friend the ultimate brow wardrobe! See website terms and conditions. This entry was posted on Tuesday, October 2nd, 2018 at 1:29 pm and is filed under Get the Look, Hints & Tips, Make-up, Swatches, Trends, Tried & Tested. You can follow any responses to this entry through the RSS 2.0 feed. You can skip to the end and leave a response. Pinging is currently not allowed.